On the way to Atacama (Chile) we stopped in Ecuador for a few days, partially to shoot local flora and fauna but also to get used to thin air. Several excursions in Atacama were at pretty high altitude. This image was taken in the cloud forest of Ecuador. 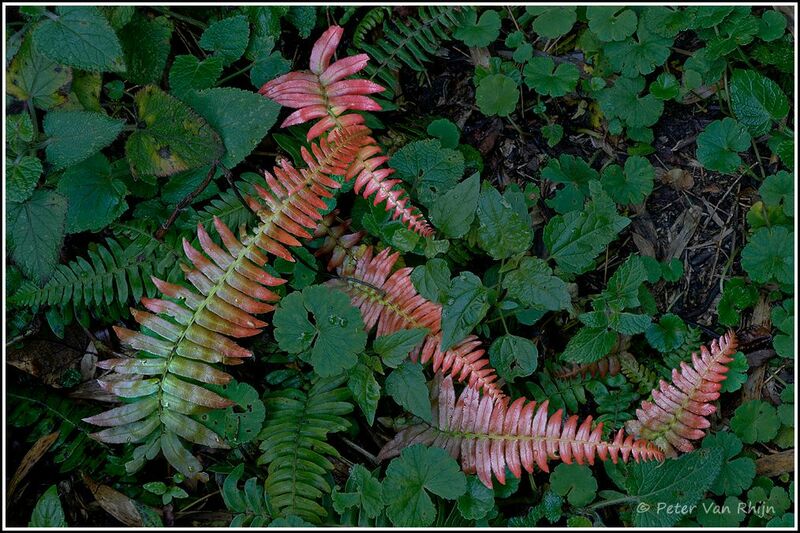 Colourful young ferns which I also remember seeing in Hawaii. The composition of these ferns is precisely as found, but I did use Photoshop to give them a bit more punch. To do so means you need to be comfortable with the rapid edge selection tool and the panel for refining the edge selection. This z-curve provides a simple shape for the eye to follow. In more northern climates we don’t see coloured ferns, so the ingredients include ‘The Unusual’, ‘Simplicity’, ‘Impact’, and very ‘Clear direction for the eye’. Refer to “The Ingredients” on my website for more details. Sony @7R Mll, Lens: FE 24-70mm F4 ZA OSS ISO160, F22, 0.3 sec.